Geoffrey Peter Murphy was a New Zealand filmmaker, as a producer, director and screenwriter best known for his work during the renaissance of New Zealand cinema that began in the last half of the 1970s. His second feature Goodbye Pork Pie (1981) was the first New Zealand film to win major commercial success on its own soil. Murphy directed several Hollywood features during the 1990s, before returning to New Zealand as second-unit director on The Lord of the Rings film trilogy. Murphy was also at different times a scriptwriter, special effects technician, schoolteacher and trumpet player. The filmscreened out of competition at the 1983 Cannes Film Festival,  and became the second most successful local movie released in New Zealand to that date. Positive reviews in America, including a rave review from Pauline Kael, helped win Murphy directing work in Hollywood. The 36th Cannes Film Festival was held from 7 to 19 May 1983. The Palme d'Or went to the Narayama Bushiko by Shōhei Imamura. Pauline Kael was an American film critic who wrote for The New Yorker magazine from 1968 to 1991. Kael was known for her "witty, biting, highly opinionated and sharply focused" reviews, her opinions often contrary to those of her contemporaries. She was one of the most influential American film critics of her era. Utu is a Māori concept of reciprocation or balance. Anzac Hohepa Wallace, also known as Zac Wallace, born Norman Pene Rewiri, was a New Zealand actor and former trade union delegate. 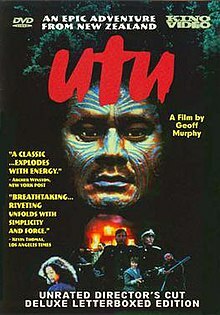 He is best known for his role as Te Wheke in the 1983 New Zealand film Utu. Tim Eliott (1935–2011) was a New Zealand actor. His mother died when he was one and he was brought up by aunts and grandparents until he joined his father in England after the war where he went to public schools in Bath and Bristol. He returned to New Zealand in 1950. The film's immediate reception was less positive than Murphy's earlier works, although still positive. Locally the film was very commercially successful, being New Zealand's second highest-grossing film at the time (behind Murphy's previous effort, Goodbye Pork Pie ). Te Rauparaha was a Māori rangatira (chief) and war leader of the Ngāti Toa tribe who took a leading part in the Musket Wars. He was influential in the original sale of land to the New Zealand Company and was a participant in the Wairau Affray in Marlborough. The Musket Wars were a series of as many as 3,000 battles and raids fought throughout New Zealand among Māori between 1807 and 1845, after Māori first obtained muskets and then engaged in an intertribal arms race in order to gain territory or seek revenge for past defeats. The battles resulted in the loss of between 20,000 and 40,000 lives and the enslavement of tens of thousands of Māori and significantly altered the rohe, or tribal territorial boundaries, before the imposition of colonial government in the 1840s. The wars are seen as an example of the "fatal impact" of indigenous contact with Europeans. Ngāti Maniapoto is an iwi (tribe) based in the Waikato-Waitomo region of New Zealand's North Island. It is part of the Tainui confederation, the members of which trace their whakapapa (genealogy) back to people who arrived in New Zealand on the waka (canoe) Tainui. 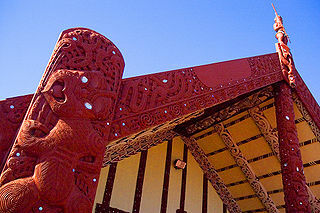 The 2006 New Zealand census shows the iwi to have a membership of 33,627, making it the 7th biggest iwi in New Zealand. Smash Palace is a New Zealand feature film, released in April 1982. The film chronicles a former race car driver who inadvertently contributes to the end of his marriage, then kidnaps his daughter. Lawrence's character runs a carwrecking yard in an isolated area of New Zealand's North Island. The Bishop of Aotearoa is a bishop in the Anglican Church in Aotearoa, New Zealand and Polynesia. The post was created in 1928. The Bishop of Aotearoa is the most senior bishop and head of the Māori Anglican Church. The Bishop of Aotearoa is recognized as the Spiritual Leader of the Māori people. Along with been the Metropolitan of the Māori Anglican Church, he also holds the title of Primate and Archbishop of Aotearoa New Zealand & Polynesia. The office of Bishop of Aotearoa is currently held by Archbishop Donald Tamihere, who was installed in April 2018 at Manutuke Marae. Barry Ronald Barclay, MNZM was a New Zealand filmmaker and writer of Maori and Pākehā (European) descent. A taua is a war party in the tradition of the Maori, the indigenous people of New Zealand. Contemporary knowledge of taua is gleaned from missionary observations and writings during the Musket Wars of the early 19th century and the later New Zealand wars. The reason to gather a taua may be for reasons of seeking revenge (utu) or seeking compensation for an offence against an individual, community or society (muru). Ngati is a 1987 New Zealand feature film directed by Barry Barclay, written by Tama Poata and produced by John O'Shea. Te Hana Hudson is a fictional character on the New Zealand soap opera Shortland Street who was portrayed by Vanessa Rare for two stints from 2001 to 2005. The matriarch of the Hudson family unit, Te Hana was introduced during an infamous revamp of the show and was a representation of the working class New Zealander. Hohi Ngapera Te Moana Keri Kaa is a New Zealand-born writer, educator and advocate for Te Reo Māori. She is of Ngati Porou and Ngati Kahungungu descent. ↑ "Festival de Cannes: Forbidden Relations". festival-cannes.com. Retrieved 2009-06-22. 1 2 Martin, Helen and Sam Edwards. New Zealand Film: 1912–1996. Oxford University Press, 1997, p. 87-88. 1 2 "Utu". NZ On Screen . Retrieved 26 June 2015.